After cementing his rule over Mongolia, Genghis Khan led his Mongol hordes south to invade China. In ad 1205, Mongol ruler Genghis Khan, having completed the unification of his Gobi Desert empire, began looking south toward China for further conquest. The ever-truculent Mongols had been a thorn in China’s side for more than 2,000 years. Their many raids were the main reason the Chinese had constructed a 1,500-mile-long Great Wall from the eastern coast on the Pacific Ocean to the very edge of the Gobi. Not without reason did the Chinese consider the Mongols barbarians—their very name meant “earth shakers.” At the head of a united army of fearsome nomads, Genghis Khan would soon make the earth shake again. Genghis’s first target was the western Chinese kingdom of Xi Xia. The Xi, known to the Mongols as the Tanguts, had emigrated east from the mountains of Tibet to the hilly grasslands centered on the Yellow River in the 7th century ad. The Mongols and the Xi, as wary neighbors, shared some of the same relatives; one of Genghis’s own stepdaughters was the wife of a Tangut chieftain. Family ties meant little to Genghis Khan. His father, Yesugei, had been poisoned by grudge-bearing members of a Tatar clan when Genghis, then called Temujin, was eight. Five years later, Temujin killed his own half brother Begter in cold blood after the two quarreled over some birds and minnows that Temujin had caught. “Apart from our shadows we have no friends,” he had been taught from the cradle. It was lesson he never forgot. After he had consolidated his power, Genghis Khan killed every male member of the Tatar clan that had killed his father—any boy taller than a wagon wheel was struck down. The Mongols attacked the Xi Xia in 1209, first taking the border settlements north of the Yellow River. The 75,000 Mongol invaders faced an army of 150,000 Xi Xia troops near their capital at Zhongxing. The Xi Xia had stationed 100,000 armored pikemen and crossbowmen in large phalanxes in the center of the battle line, with 25,000 Tangut cavalry on each wing. The Mongols were not accustomed to being outnumbered. As nomadic warriors they traveled fast, in huge columns of superbly skilled cavalry, often separated by many miles but knit together by an intricate system of signal fires, smoke signals, and flags, and a gigantic camel-mounted kettledrum to sound the charge. They were used to coordinating their forces on small settlements or camps whose residents could not move with anything like the same speed or decisiveness. The Mongols were interested not in a fair fight, but a victorious one. In the Xi Xia, however, they ran into an opponent who fought much the same way they did. The Mongols had taken extensive casualties in an earlier battle with the Xi Xia pikemen by charging their pike wall; they were determined to not repeat the mistake. The Mongol light cavalry rode parallel to the Chinese pikemen and crossbowmen, firing thousands of arrows into them while other Mongol forces fought with Tangut cavalry on the flanks. The Mongol and Tangut cavalry also rode parallel to each other, firing thousands of arrows and inflicting innumerable casualties on each side. Each side’s cavalry feigned retreat, but the other side wouldn’t fall for the ruse. Finally, the Mongols attacked the Tangut cavalry with their heavy cavalry. The Tangut cavalry broke and ran, leaving the huge phalanxes of the Xi Xia pikemen vulnerable to attack. The Chinese pikemen had formed a giant rectangle that faced in all directions, and they took repeated volleys of arrows that inflicted great damage while the Mongols themselves stayed mostly out of range of the Chinese crossbows. After the Xi Xia pikemen lost unit cohesion, the Mongol heavy cavalry attacked the remaining demoralized and exhausted Chinese from all sides to finish them off. The Xi Xia capital of Zhongxing presented a new problem for the Mongols, who had little experience in siege warfare. In an earlier siege of the walled city of Volohai, the Mongols had attempted a series of suicidal assaults with scaling ladders that failed, and they suffered heavy casualties in the fighting. Genghis offered to lift the siege of the city provided the residents gave the Mongols 1,000 cats and 10,000 swallows in cages. The puzzled citizens of Volohai quickly granted the request—and just as quickly lived to regret it when the animals fled back into the city with tufts of flaming wool tied to each of them by the Mongols. Soon, the whole city was ablaze. While the defenders were occupied with putting out the fire, the Mongols scaled the now undefended walls and massacred the inhabitants. Genghis did not want to face a similar costly assault of the walls of Zhongxing. Instead, he decided to break the dikes on the Huang River and flood the city below. The plan backfired, however, when the Mongol camp itself was flooded and hundreds of troops were swept away by the raging waters. To make matters worse, the move left two feet of standing water for miles around the city, in effect creating a ready-made moat. The Mongols retreated into the surrounding hills but returned in force in 1210. Xi Xia Emperor Li Anquan, not wishing to face another siege, agreed to give his daughter Chaka to Genghis Khan as a wife and to pay tribute to the Mongols as a vassal state. Genghis demanded and received another 1,000 young men and women, 3,000 horses, and vast quantities of gold, jewelry, and silk. The Xi Xia later rebelled in 1218 and 1223 because they tired of providing the Mongols with so many men to fight in their wars of conquest, but these rebellions were brutally put down. In 1210, an emissary of the newly installed Jin emperor, Prince Wei, appeared before Genghis and demanded his submission and a tribute paid to the Jin. An infuriated Genghis answered that it was the Jin who needed to pay tribute to him; he spat on the ground as a gesture of defiance. With his flank secured by the conquest of Xi Xia, Genghis was ready to attack the mighty Jin Dynasty. In 1211, 30,000 Mongol troops under Genghis’s greatest general, Subedei, assaulted the Great Wall. The Mongols brought up groups of archers who cleared an area of wall while other Mongols scaled the wall with ladders and took possession of sections of it. The Jin rushed in reinforcements and recaptured the lost sections of the Great Wall. Thousands died on both sides as the fighting continued back and forth for several days. The Jin brought most of their army to back up the forces defending the Great Wall. What the Jin didn’t know was that Subedei’s attack was merely a diversion. Some 200 miles to the west, Genghis and a force of 90,000 Mongols were crossing the Great Wall at its end in the Gobi Desert. The Onguts, a tribe similar to the Mongols, were supposed to be guarding the western end of the Great Wall for the Chin, but they defected to Genghis and allowed the Mongols to cross into China unmolested. After Genghis’s cavalry poured into China, Subedei’s force broke off its attack and crossed over into China from the end of the Great Wall as well. The Jin forces were now out of position and moved to cut off the Mongols from Beijing. Genghis’s cavalry caught close to 200,000 Jin troops on open ground near Badger Pass, where the Jin hoped to block the Mongols from advancing any farther. The Jin formed for battle with the pike phalanxes and crossbowmen in the middle and armored heavy cavalry on the flanks. The outnumbered Mongol heavy cavalry engaged in a hotly contested battle on the flanks with the Jin cavalry as the densely packed Jin phalanxes and their crossbowmen held off the Mongol horse archers. Suddenly, Subedei’s remaining 27,000 Mongols (3,000 had died at the Great Wall) showed up on the battlefield on the flanks and rear of the Jin army. The rout was on. After the Jin cavalry was defeated, the Jin pikemen, half of whom were militia conscripts, broke and ran. They were cut down by the Mongol cavalry or trampled by their own terrified horsemen. Bodies stacked “like rotten logs” littered the ground for more than 30 miles. Genghis then separated his army into three forces that burned, pillaged, raped, and murdered the populations of 90 cities over the next six months. Despite the awful destruction, the Jin would not surrender. Genghis became frustrated by the enormous size and scope of a nation-state like the Jin. He entered into negotiations with the emperor and agreed not to attack any more cities. The Mongols had already captured well over 100,000 Chinese prisoners; to make a negotiating point, Genghis had them executed. The next year the Jin moved their capital farther south, from Beijing to Kaifeng, and began rebuilding their armies. Genghis was angered by the move, which he considered a betrayal of trust, and looked for an opportunity to attack the Jin again. In the spring of 1213, the Jin attacked the Mongol-allied Khitan tribe in Manchuria. Genghis came to the aid of his Khitan allies and attacked the Jin armies in Manchuria, which fell back to their fortifications at Nankuo Pass. The Mongols were blocked from attacking Beijing by the well-fortified Jin positions at the pass and by the eastern sections of the Great Wall. The Mongols headed into the pass and then retreated. It was all a ruse. The Jin forces hurried to trap the fleeing Mongols, recklessly leaving their fortified positions to pursue them. The Mongols led the Jin forces into their own trap and destroyed most of the Jin army. Those Jin troops that had not pursued the Mongols fled their fortified positions and retreated to the Great Wall, with the Mongols in hot pursuit. The Mongols caught and destroyed the remaining Jin troops as they tried frantically to retreat through the Great Wall. The Mongols then passed through the open gates of the Great Wall. Siege of Baghdad by the Mongols, 1258. Persian manuscript illumination, 14th century. The Mongols began besieging the more than one million residents of Beijing. Beijing was a tough nut to crack, with walls and moats that extended more than nine miles around the city, and was watched over by 900 towers. The city’s defenders had double and triple crossbow ballistae and trebuchet catapults that fired clay pots filled with naphtha-like incendiaries that exploded and set on fire whatever they hit. The Jin also introduced one of the first poison gas weapons in history, firing projectiles bound in wax and paper of 70 pounds of dried human waste, ground-up poisonous herbs, roots, and beetles packed in gunpowder. The projectiles were lit with a fuse and fired from a trebuchet, creating a deadly cloud of toxic fumes that killed or disabled anyone unfortunate enough to breathe in the poisonous dust. The Jin also had clay-pot firebombs filled with incendiaries to throw from the walls and hot oil to pour down on attackers. The Mongols launched attacks against the walls with ladders, but lost dozens of men to the incendiaries and the hot oil. The Mongols then forced Jin prisoners to build and push forward siege engines and serve as human shields for the attackers. Jin soldiers would recognize family and friends among the captives and hold their fire. 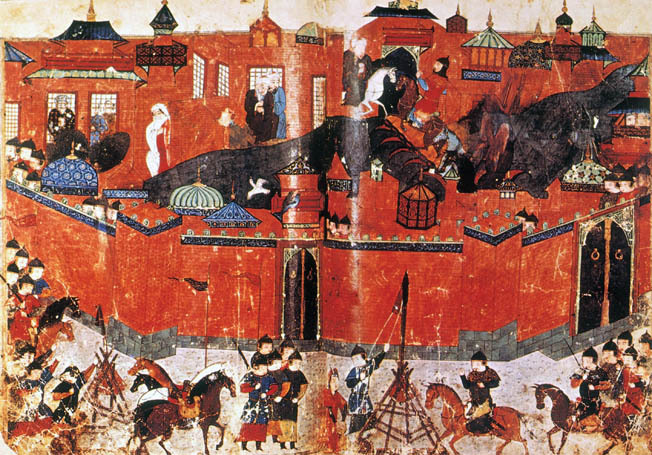 Many Jin prisoners were killed from missed crossbow fire aimed at the Mongols and from the bombs used to burn down the siege engines before they could get into the city. The Mongols and their Chinese human shields dug trenches covered by cowhide up to the walls to undermine them, but the Jin dropped firebombs from chains onto the trenches that exploded with such force that they left only smoldering craters and no intact human remains. The siege dragged on for a year as starvation and disease began killing people on both sides of the walls, but the defenders, with more than a million people to feed, had the worst of it. Two Jin relief columns loaded down with food were intercepted by the Mongols, and some defenders in Beijing turned to cannibalism to survive. In June 1215, the Jin commander escaped to Kaifeng, where he was executed by the emperor for leaving his post. The desperate people of Beijing then opened the gates of the city to the Mongols, who ransacked the city and massacred thousands in revenge for their ordeal. The city was set on fire. Thousands of girls ran to the city’s steepest walls and threw themselves to their deaths to escape the flames and the unwanted amorous attention of the Mongols. A year later, the ambassador of Khwarezm described seeing mountains of bones inside and outside of what had been the greatest city in the world. Despite the overwhelming victories, the Mongols were trapped in a long war of attrition in China. Rather than finish the conquest of the Jin, Genghis became sidetracked in 1217 in the destruction of Khwarezm (Iran, Pakistan, and Afghanistan), an Islamic holocaust in which more than a million people were massacred by the Mongols. During the campaign to conquer Khwarezm, the Mongols brought in thousands of Chinese engineers, siege engines, and crews to help reduce Islamic fortifications. In 1223, Genghis turned his attention back on the Jin. He sent a trusted general, Mukhulai, with 100,000 troops to attack Chang’an, which was defended by 200,000 Jin troops. Mukhulai became ill and died. As soon as this happened, the Xi Xia troops abandoned the Mongol army, which in turn caused the siege to be abandoned. Genghis then hunted down and killed the Xi Xia troops who had deserted his army. Genghis himself died in 1227, probably from typhus, while planning yet another massive invasion of Jin. His son, Ogedei, ascended the throne and sent envoys to the Jin, who promptly had them executed. Meanwhile, Subedei was to conduct one last effort to conquer the Jin in 1231. The Jin armies all faced north to prevent Subedei’s 120,000 Mongols from crossing the Yellow River. Subudei sent a general named Tuli with 30,000 Mongols on an arduous journey across the western Chinese mountains of Sichuan and through Song territory into southern Jin territory. The Jin panicked, thinking the Mongol force was much bigger than it was. The Jin repositioned the majority of their troops to the south and began pursuing the Mongols with a massive force of over 300,000 men. The Mongols retreated as planned into the Sichuan Mountains as the huge Jin army followed them. The Mongols fought a tenacious rearguard action with their archers in the rough mountain terrain, killing thousands of pursuing Jin. The Mongols led the Jin higher and deeper into the snow-covered mountains, where additional thousands froze to death or fell off the icy trails. The Mongols circled back through the mountain passes and destroyed the Jin baggage trains, adding starvation to the woes the Jin troops were already enduring. Once Subedei had the main Jin army trapped in the mountains of Sichuan, he moved his 120,000 Mongols across the Yellow River against the much smaller Jin forces. The Jin belatedly realized their mistake and began desperately trying to get their main army out of the mountains to defend the capital. The Jin retreat turned into a rout as Tuli’s and Subedei’s forces massacred the entire Jin army without mercy on the open ground within sight of Kaifeng. The Mongols had learned well from their Chinese prisoners how to conduct sieges. They built a 54-mile-long wooden wall of contravallation to hem in Kaifeng’s one million frightened inhabitants. In addition to the almost 150,000 Mongols conducting the siege, the Song sent 300,000 troops to help finish off their Jin enemies. For six days, the Mongol and Song armies assaulted Kaifeng’s wall but took thousands of casualties from a dreaded weapon called a ho pao, a long bamboo tube filled with incendiaries that could be lit with a fuse or thrown into siege engines from holes in the walls to explode with such force that it left craters in the ground and burned everyone in the immediate vicinity. Thousands of Mongol and Song Chinese troops died in assaults against Kaifeng’s stout walls. Seige of the Chinese fortress O-Chouand pontoon bridge over Jangtsekiang. It was clear to Subedei that a long siege was needed to reduce the Jin capital. Plague soon broke out in Kaifeng, and Subedei withdrew his forces to let the disease destroy his enemies while the Mongol and Song armies remained plague-free. Within a month, the Jin emperor committed suicide and the Mongol and Song armies broke into Kaifeng and began massacring the population. Ogedei ordered the massacre to be stopped and aid brought to the suffering people. Subedei wanted to massacre the entire Jin population and turn the farmland into grazing fields for Mongol horses, but Ogedei overruled him. Ogedei’s Chinese advisers had convinced him that the Jin population would provide lucrative taxes, craftsmen, and soldiers for future Mongol conquests. The Jin held out until 1234 before being overwhelmed by the combined Mongol and Song forces, ending the Jin dynasty forever. In 1235, the Song sent their armies to occupy the Jin cities they understood would be given to them by the Mongols for their part in the war. Instead, the Song armies were repulsed by Mongol forces using many of the same weapons and methods to defend the cities that they had learned from the Jin. This started a 43-year-long war between the Mongols and the Song that would claim many more thousands of lives. In 1236, the Mongols captured the city of Xiangyang in Sichuan Province. The Mongols and the Song fought for control of Sichuan around the city of Chengdu until 1248, when the Mongols gained solid possession of the area. By 1248, the Mongols had killed hundreds of thousands of Song and reduced many Sichuan cities to rubble. In 1251, Mongke was elected Great Khan and decided to intensify the war with the Song Dynasty. In 1253, some 100,000 Mongols and their Chinese allies captured Dali and Yunnan and crossed through Laos to attack the Song Empire’s southern flank. The next year, the Mongols clashed with more than 100,000 Song troops and 1,000 war elephants near the Laotian border. The Mongol horses would not charge the elephants, so the Mongols dismounted and fired flaming arrows to kill or enrage the great animals, which became uncontrollable and randomly killed men on both sides. The battle degenerated into a chaotic hand-to-hand battle. Both armies virtually annihilated each other, and the Mongols withdrew into Laos with only 20,000 men. In 1257, Mongke made the mistake of invading Da Viet (North Vietnam) and lost most of the rest of his men and horses to disease in the intense tropical conditions. In 1258, Mongke pulled together 300,000 Mongol and Chinese soldiers to face a massive army of over 400,000 Song Chinese troops under General Wang Jian in Sichuan. In 1259, the two sides met at the Battle of Diaoyucheng. During the battle, Mongke collapsed and died from cholera and dysentery. The battle ended in stalemate, with more than 100,000 dead on both sides, including Wang Jian. The new commanding Song general, Jia Sidao, collaborated with Genghis Khan’s grandson, Prince Kublai, and worked out a deal whereby the Song army would occupy Sichuan under Mongol authority. After the Mongol forces left Sichuan, Jia Sidao reneged on his agreement and reoccupied Xiangyang, returning Sichuan to Song control. In 1260, Jia Sidao took his army back into Song territory and established himself as prime minister with a new young emperor named Zhao Qi, who would serve as puppet ruler. Meanwhile, Kublai left Sichuan and took his army back to Mongolia to stake his claim as the new khan of the Mongol Empire. Later that same year, Kublai became khan of the Mongols and established the Yuan Dynasty in China, with himself as emperor. In 1265, a Chinese allied naval force destroyed 100 Song ships in a river battle, and Mongol troops defeated the isolated Song army to regain control of part of Sichuan. The key to conquering the Song was capturing the twin fortress cities of Xiangyang and Fancheng. Both cities had thick walls with wide moats protecting the convergence of the Han and Yellow Rivers. In 1268, the Mongols built fortifications downriver from Xiangyang on the Han River to cut off resupply of the city by ship. Most Song ships were able to run by the Mongol forts and resupply Xiangyang and Fancheng. Chinese ships allied with the Mongols were brought in to block the passage between the Mongol forts. More than 20 miles of siege lines were built around Xiangyang and Fancheng on both sides of the Han River. The Mongols and their Chinese engineers set up trebuchets and began firing incendiary clay bombs and exploding biochemical projectiles they had learned from the Jin at the siege of Beijing in 1215. The Song fired incendiary bombs and biochemical projectiles at the Mongols as well, causing great destruction and loss of life on both sides. The Mongols had to pull back after their wooden siege walls and trebuchets caught fire from the bombardments, leaving the Mongols with no cover, while the Song defenders took shelter behind the twin cities’ stout rock and masonry walls. 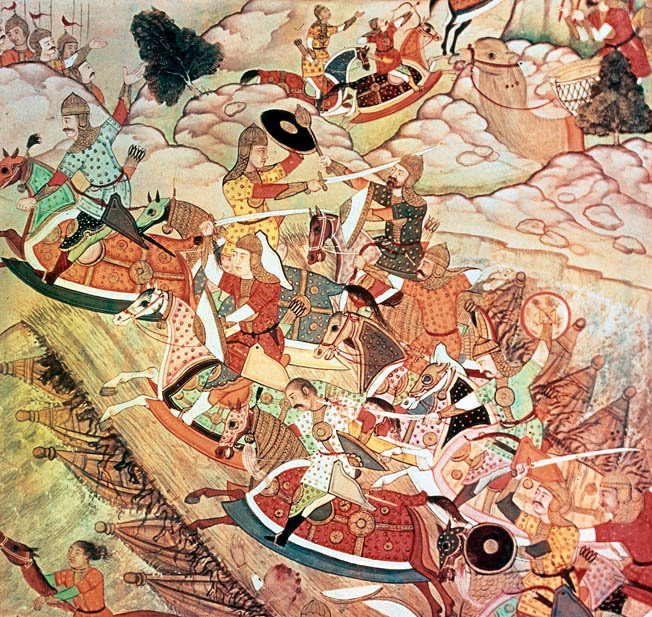 In 1269, Kublai Khan sent another 20,000 troops to replace those in the previous year’s fighting. More than 3,000 Song ships attacked the Mongol forts on the Han River in an effort to break the blockade, but 500 ships were sunk by Kublai Khan’s brilliant admiral Liu Cheng, who had defected to the Mongols. Mongol and Chinese troops clambered aboard the Song vessels and beheaded hundreds of Song soldiers and sailors. The besieged Song tried several unsuccessful attempts to break out but were defeated each time with thousands of casualties. In 1271, 100 Song ships successfully broke through a boom across the Han River to bring 3,000 soldiers and much-needed supplies to reinforce Xiangyang. The siege dragged on with no real advantage for either side until Kublai Khan decided to send a Muslim engineer captured during the siege of Baghdad to China to build a giant 40-ton trebuchet that could hurl 220-pound projectiles more than 600 feet to breach the cities’ walls. After a few days, a breach was opened and Mongol troops stormed through to meet the Chinese defenders. For days, men fought and died in the vicious battle at the breach. The Song were able to throw more soldiers into Fancheng to defend the breach from a pontoon bridge that connected Xiangyang across the Han River. The Mongols called off the assault on the breach and used their giant trebuchet to widen the breach and destroy the pontoon bridge. Incendiary bombs fired from the trebuchet struck the bridge and consumed it. With Fancheng cut off from reinforcements, the Mongols assaulted the widened breach. The disheartened defenders held on for several hours before resistance broke and the Mongols poured into the city and began massacring the inhabitants. The Mongols took the last 3,000 Song soldiers and 7,000 inhabitants to the walls facing Xiangyang and in full view slit the prisoners’ throats and threw them off the wall. The Mongols then dismantled their giant trebuchet and repositioned it across the river facing Xiangyang. The first shot from the trebuchet forced a tower to collapse in a great crash as the Song inhabitants screamed in terror. Kublai Khan offered to spare the inhabitants and to reward the Song commander if he would surrender the city. Xiangyang was surrendered and the Song heartland was open to the Mongols. The siege had lasted from 1268 to 1273. In 1274, the Mongols headed down the Han River, bypassing Song fortresses and emerging onto the flood plains of the Yangtze River. The Mongols now faced the impregnable fortress of Yang-lo. The Mongols sacrificed several thousand Chinese troops on a frontal attack on Yang-lo while most of the Mongol army, carrying a number of ships, bypassed the fort and crossed the river upstream. Then the Mongol and Chinese fleet came down the Yangtze and attacked the Song fleet from both front and behind. The Song boats were packed so close together on the river that incendiary bombs fired from Mongol catapults set much of the Song fleet on fire. Thousands perished in the flames. Fortress Yang-lo and the 100,000 cut-off Song troops surrendered the next day. In 1275, Jia Sidao set out from the capital of Hangzhou at the head of 100,000 Song troops and another fleet of 2,500 ships in a last-ditch effort to stop the Mongol juggernaut. A massive cavalry and infantry battle took place on both sides of the river. The Mongols and their Chinese allies pushed back the Song army and boarded their ships from both ends of the river, beheading thousands of Song troops and capturing 2,000 ships. It was another overwhelming victory for the Mongols. Jia Sidao was later assassinated by a Song officer. The city of Hangzhou refused an offer to surrender peacefully and was burned. As usual, the Mongols massacred the city’s inhabitants. On February 21, 1276, the boy emperor Zhao Xian came out of Hangzhou, bowed toward the north in obeisance to Kublai Khan, and turned over the capital and the rest of the Song Empire to the Mongols. The Mongol conquest of China had taken 74 years and claimed the lives of as many as 25 million Chinese from war, plague, and famine. The ramifications of the Mongol conquest of China were felt for some time. The Ming, who overthrew the Mongols in 1368, became obsessed with improving and lengthening the Great Wall to close to 5,000 miles (including walls that backed up walls) to prevent another Mongol invasion of China. The Great Wall as it existed from the time of the Ming Dynasty was an expensive reaction to the Mongol conquest of China. In the end, the improved Great Wall did not save China. In 1644, a Mongol-like nation, the Manchu, conquered China and ruled the unhappy nation until 1911. Tags Baghdad, Battle of Diaoyucheng, China, Crossbow, Genghis Khan, Mongol siege of kaifeng, Mongols, Siege of Beijing 1215, Yangtze River.